A tough week! My fiance was traveling for work, which stinks except it was a nice opportunity to clean the house, which I did Saturday, and disinfect as he had been sick with the flu. Then Sunday I woke up not feeling very well... Sunday was followed by 5 days of Dave's nasty flu, alone - with no one to bring me soup or cold compresses (still haven't quite trained the cat...). But I survived. The good thing about being sick...lots of time to read. The bad thing about being sick...you feel too crappy to read much. This seems to be a very common book in the blogs right now, and rightfully so in light of the recent events with the rescue of Jaycee Dugard and her children. 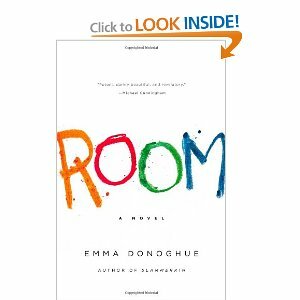 Room by Emma Donogue is told from the view of a five-year old boy named Jack. Jack and his Ma live in "Room", an 11x11 garden shed, locked away from the world. Room is home to Jack. But Room is a prison for Ma. Jack spends his day doing "thousands of things". Ma spends her days raising Jack the best she can...and dreaming of what she lost six years ago when she was kipnapped by Old Nick. Nick is a sociopath who has enprisoned and sexually abused Ma for years. As Jack gets older and more curious, and Old Nick becomes less reliable and more dangerous, Ma realizes that both she and Jack are doomed if they do not escape. But, it turns out that escape from Room is not all its cracked up to be. This was a really great story. The writing is extremely good and the story is so creative and different from anything I have read before. You are pulled into little Jack's world and truly begin to see the world through a child's eyes. You fall in love with Jack while in Room and truly feel compassion when he is faced with saying goodbye. But you also feel for Ma, understanding the choices she has made to ensure the safety and care of her beloved Jack. 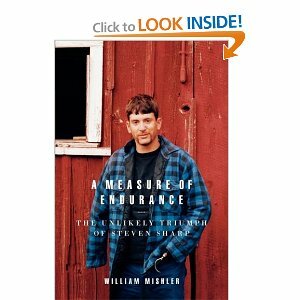 A Measure of Endurance by William Mishler tells the harrowing story of 17 year old Steven Sharp, a farm-boy from Oregon, who's arms are tragically severed when a hay baler he is working around spontaneously starts running, catching his hands. After the accident, the Sharp family is approached by a lawyer who has fought against the baler's manufacturer in the past, for similar issues, and convinces Steven and his family to fight . The legal battle unfolds, with the crux of the argument being whether Steven in fact turned the baler "off" before approaching it. Ultimately, no answer is rendered...but a fair settlement is awarded. I enjoyed this nonfiction story, as I often do, because of the memoir-ish feel of the writing. Mishler, who himself passed away recently, tells the story with just enough emotion, but no shmultzy-sentimentality. Though it seemed clear to me that the author, and most likely the readers, side with the Sharp family, the defense is by no means demonized. Potential readers will be glad to know that the story is neither overly goory [there is one short scene where Steven tells his story in court that made me woozy...though that could have been the flu], nor is it overly legal mumbo-jumbo. Overall, its just a good read about a tragedy and how the family ultimately triumphs. I am a child of the 70's and a teen of the 80's and much of my musical interest is deeply rooted in those decades. While listening to the radio recently I discovered that much of the music I love is fast becoming "oldies". Ok...so I'm getting old. A positive note, however, is that the artists I like are reaching an age where they want to assess their lives (and hopefully make a few bucks doing it). 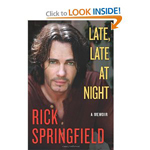 I was thrilled, therefore, to see Rick Springfield (Jessie's Girl, General Hospital) release his autobiography, Late, Late at Night. I have long been a fan and have always expected that there was much more there than I knew...and boy was I right! In this candid memoir, Springfield talks about his childhood in Australia and England and of his growing passion for music...and women. He shares stories about his rise to fame (if Aussie celebrity can be called that), his eventual move to the U.S. and achieving celebrity. He shares honestly his life-long struggles with depression, despite his success, and his efforts to tame the beast, a struggle he continues to fight today though with a bit more understanding and skill. 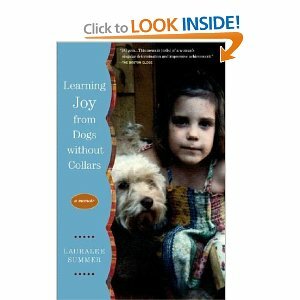 In her memoir, Learning Joy from Dogs without Collars, Lauralee Summer tells her "homeless to Harvard" story with just enough sarcasm and trepidation to make her real. From her childhood in Oregon and California, where she and her mother moved regularly and sometimes lived in shelters to survive, to her teens years spent in Quincy, Massachusetts she shares her struggles and helps the reader to truly understand the plight of the poor. With the guidance of her beloved "Mr. Mac", a teacher and friend, and a focus on high school wrestling Summer manages to not only get through high school but gain acceptance to Harvard University, due more perhaps to her uniqueness than her grades, an issue that keeps her in fear of being "found out". Unlike other similar stories however, Summer doesn't fit seamlessly into the Harvard world and live happily ever after. She talks candidly about her struggles to find herself and figure out her place, not only at Harvard but in the world. In doing so, she becomes the first female on the Harvard wrestling team and creates her own course of study in order to succeed, eventually reconnecting and forging a strong bond with a father who denied her as a child. In the book, Summer speaks often of the juxtaposition between her life at Harvard and at home with her mother (who continues to live in and out of shelters while Summer completes college), the varied differences between her Harvard world and her home world. Unfortunately, her writing suffers from the same confusion...flowing from comfortable conversation about the realities of poverty and homelessness, to pretentious intellectualism about sexism and such issues. She lost my attention more than once during long-winded rants... At times she is interesting and engaging and others she is just boring. Despite that, when she's good, she's very good. 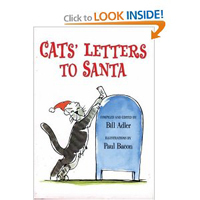 A very cute, fairly short collection of potential letters from various feline's to Santa Claus. Not particularly gut-busting funny though. A good Christmas gift, especially for those "no clue what to get them" kids, or cat lovers. Nice illustrations. My apologies for taking so long to get my first book review up. Of course, it being my first…I seriously doubt there are many folks out there anxiously waiting, on the edge of their seats, for my comments (hopefully there will be some day!)... But it was well worth it, because this my first Blog Read was a 4+ winner! A story about a juvenile delinquent turned Olympic hopeful? A story about a war hero? A story about a WWII prisoner of war? A story about being stranded at sea fighting for survival? And a story about a survivor who battles, and beats, post-traumatic stress and finds peace and forgiveness in God? Let me save you a little time. 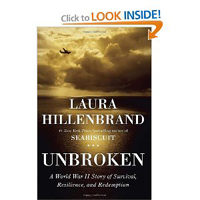 Unbroken by Laura Hillenbrand, author of Seabiscuit, is all of these...and every one of its 496 pages is wonderful (so don’t let that scare you off)! From the first pages describing the childhood of Louie Zamperini, a hellion who barely avoids being locked up in ‘Juvie’ on more than one occasion, to the final pages when you realize that this amazing, strong and resilient wonder is still alive and kicking in his 90’s…you fall in love with this man. In the interim, you learn about Louie's family’s efforts to focus his energy on track and running, which ultimately leads an Olympic career. Unfortunately, his gold medal dreams are destroyed with the start of WWII. After signing up, Louie is sent to fight in the Pacific where his plane ultimately crashes, leaving all dead but himself and two crew mates. They float westward, toward Japan and the enemy, for a record breaking 41-days. After an enemy attempt fails to destroy their raft and drown them, the two remaining men are eventually caught by the Japanese and sent to endure years in captivity in work camps. Barely surviving starvation, sickness and extreme cruelty by their captors, they are finally released at war’s end and sent home to recuperate from their experiences, with little assistance and guidance. After struggling with obvious (but yet unacknowledged) post-traumatic stress, Louie eventually discovers that the only way to move forward is to forgive his captors and, with his newly found belief in God, is able to do so. This book reads very smoothly and, surprisingly, quickly. While being a wonderful and interesting novel, it also gives you a never-boring history lesson and leaves you wanting more. Definitely worth the read (and the few cents in late charges from the library)!